Northern white rhino: Last known male, Sudan, protected by guards as efforts continue to save his species. Sudan, pictured here in 2010, is the last known male northern white rhino in the world. 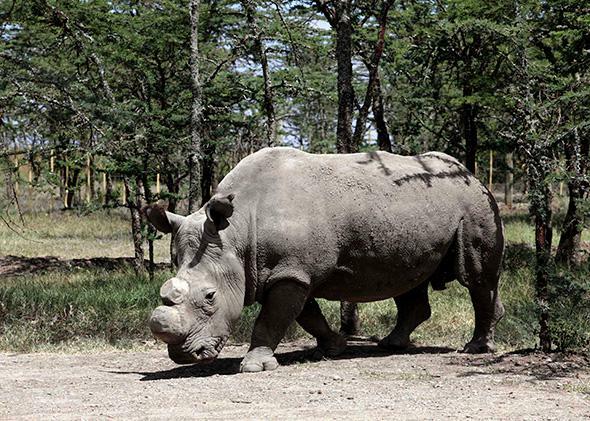 A northern white rhinoceros named Sudan is now being accompanied around-the-clock by armed guards as he roams the Ol Pejeta wildlife refuge in Kenya, because he’s the last known male of a threatened subspecies. Poachers in search of rhino horns are believed to have killed all but five of the animals. CNN reports that biologists are concerned that Sudan, at what the network described as an elderly age of 42, will grow too old for mating. They are working on artificial insemination and other advanced treatments that could improve the chances of impregnating Fatu and Najin, the females living with him at the refuge. [Sudan] has a low sperm count, which complicates natural and scientific efforts, experts say. The men guarding the three rhinos carry heavy weaponry and sometimes visit nearby towns “incognito” to gather intelligence on poaching activities, according to CNN. The refuge has started a GoFundMe campaign to support and equip the guards, who put their lives at risk defending the animals. The rhinos at Ol Pejeta have had their horns removed to make them less attractive to poachers. Even with a very small number remaining, there is still hope that the northern white rhino could survive. A closely related subspecies, the southern white rhino, is considered near-endangered, but its population has been rekindled from an estimated 100 in the 1800s to around 20,000 today, according to the World Wildlife Fund, thanks in part to aggressive conservation and breeding efforts. It’s possible Sudan’s keepers could take a cue from a British zoo, where two southern white rhinos were recently given “animal Viagra” to boost their chances of conception.